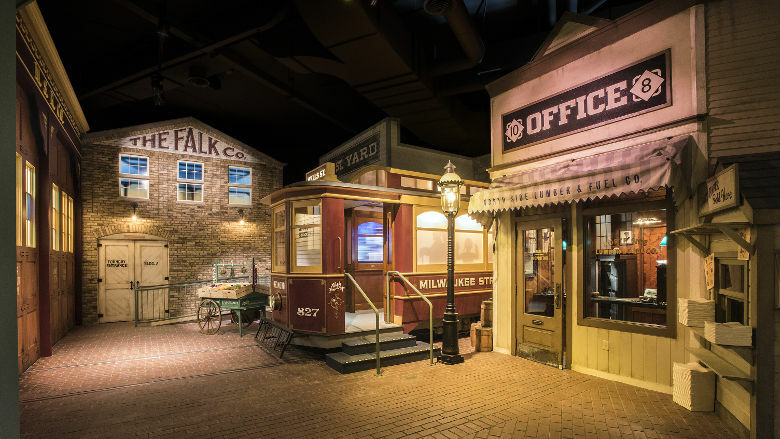 The Milwaukee Public Museum recently unveiled some big changes to their beloved Streets of Old Milwaukee exhibit, integrating 21st century digital technology to enhance this slice of turn-of-the-century Milwaukee life. But, never fear: Granny, cobblestones, and the candy shop all remain in this famous walk-through diorama. Since the Streets of Old Milwaukee first opened in January 1965, millions of visitors have passed through a street-level experience of another generation’s Milwaukee. Gaslit lamps, penny candy, and well-preserved antiques of the era—many of which were donated by community members—remain the heart and soul of the exhibit’s immersive experience. “Streets has become part of Milwau­kee’s history. We’re very excited to build on that history by implementing changes that will enhance not only the Streets themselves, but deliver the kind of visitor experience contemporary museum-goers expect,” says Dennis Kois, Milwaukee Public Museum President and CEO. One such enhancement includes the streetcar that forms the new entrance to the exhibit. Video screens run down both sides of the car. As visitors walk through the streetcar—moving from daylight to dusk—they travel up the stream of history, watching the passing scene of historical changes to iconic Milwaukee businesses, churches, and other buildings as well as passersby in period garb from 1910 to 1950 to today. At the streetcar entrance, visitors can download a new interactive mobile app that prompts audio narratives as they approach specific locations. The audio, often in the form of stories told by local characters, provides intimate glimpses of early-20th century life. The mobile app adds even more depth to a carefully designed exhibit that is full of elements both fascinating and nuanced. Newly installed walls of Cream City brick, an architectural staple of the time, are plastered with German-language flyers advertising entertainment and political theater. Video-projected shadows of workers flicker across Falk Company factory windows, and recorded scenes viewed opaquely through the original Pfister Hotel doors evoke the immediacy of human activity. Sound tracks add another dimension to the experience, recreating the noises Milwaukeeans would have heard walking the streets in real time: the clip-clop of horses and the whistles of trains rising in crescendo before receding into the back­ground again. Visitors can lean against the window of an auto mechanic’s garage to hear his frustrated mutters, even listen in on the telephone outside the General Store to eavesdrop on a party line conversation. “The renovation of Streets gives us an incredible opportunity to both enrich [what’s] already there by taking visitors deeper into the magical experience of going back in time … [and] also to weave into that experience the viewpoints of people who were living in the city at that time, but whose voices were left out,” says Kois. The mobile audio app and aesthetic digital wizardry represent the latest effort in an ongoing process to make the Streets as detailed and comprehen­sive as possible. The exhibit underwent an earlier series of changes in the late 1990s, which included the addition of the home of Sully Watson, a freed Virginia slave whose family went on to become a wealthy and prominent part of old Milwaukee society. Before the Watson Family Home, the story of the Streets didn’t include an African-American voice. With the new digital reboot, the museum not only has amplified the immersive experience but also better represented the cultural and ethnic diversity of the era. To learn more about the Milwaukee Public Museum or the Streets of Old Milwaukee exhibition, go to mpm.edu or follow @MPMGranny on Twitter.